Guided Meditation uses words and images to help transfer your attention away from worry, stress, and pain to help you find inner strength, compassion, and resilience. Join us every Monday from 4-4:30pm in the Xavier Chapel (entrance through The BRIDGE Center) on the Downcity Campus. 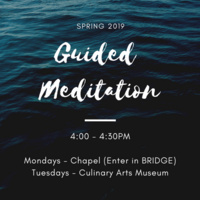 and every Tuesday from 4-4:30pm in the Culinary Beginnings Room (located inside the Culinary Arts Museum) on the Harborside Campus for a guided meditation facilitated by staff from Counseling Services, Health Education, The BRIDGE, and the JWU Providence Library.